Posted by bessie on Tuesday, March 31, 2009. We just launched #earthtweet, a campaign to raise awareness of the fight against climate change in the days leading up to Earth Day (April 22) – and beyond. If you’re already on Twitter, all you have to do is tell us what you are doing – today – for the planet. 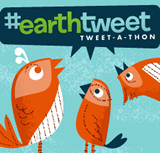 Just make sure to use the tag #earthtweet somewhere in each item you’re sharing on Twitter, so everyone else can find it. We’ll also be giving away some eco-friendly prizes throughout the campaign, so follow @earthtweet to stay posted. If you’re not yet among the converted, this is a perfect opportunity to give Twitter a try. Twitter is like CB radio, but for text messaging – it’s a great way to stay connected to friends, family, and as many other people as you like. Sign up and then you can “follow” @earthtweet and @brighterplanet! Two months ago, a group called charity: water issued through Twitter a call for help raising awareness and funds to bring clean drinking water to some of the poorest people in the world. The twitter community responded, organizing fundraisers in more than 200 cities around the world and raising a quarter million dollars for the cause. Last Christmas, a TVA coal-burning power plant spilled millions of gallons of toxic coal ash into an East Tennessee river. Advocates on the ground – with support from Twitter folks all over the country – used Twitter to report on the immense scale of the disaster. The buzz grew loud enough that the sluggish national media finally began to cover the story; since then, the Obama administration has made clean-up of thousands of dangerous coal-ash ponds all over the nation part of its agenda. PowerShift09 organizers and attendees used Twitter to serve notice that young people are energized and out in force, working to drive the nation toward a clean energy economy. Well, we want some of that action! We really hope that #earthtweet can make some noise about doing one’s part to solve the climate problem. It’s really up to all of you – #earthtweet will go exactly as far as you take it. Have a ball with it. You’ll find badges, a widget, and temporary Twitter avatars available at http://earthtweet.com.